Pianist Ivan Ilic, jazz singer Georgia Mancio and conductor Harry Bicket join Sean Rafferty in the studio. Pianist Ivan Ilic performs repertoire from composer Anton Reicha, pupil of Haydn and friend of Beethoven, who is the focus of Ivan's new album. 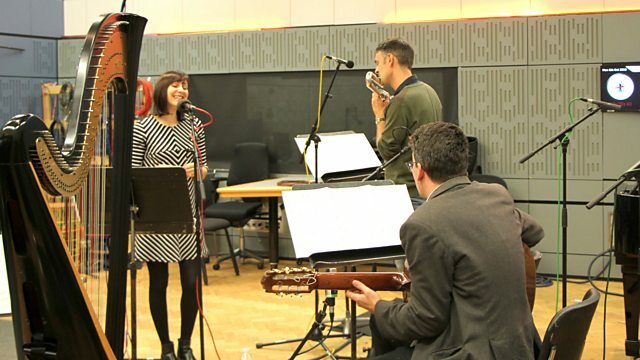 Jazz vocalist Georgia Mancio sings live ahead of her mini-festival Hang, which showcases artists from the UK’s jazz, latin and improvised scenes. She's joined in the studio by Alina Bzhezhinska (harpist), Luiz Morais (guitar), Gareth Lockrane (flute), Kate Williams (piano), and Trish Clowes (saxophone). Baroque orchestra The English Concert is celebrating its 45th anniversary with a concert at Queen Elizabeth Hall and its Artistic Director Harry Bicket talks to Sean Rafferty in the studio. Orchestra: The English Concert. Director: Harry Bicket. Dall'Abaco, Porpora, Marcello, Tartini & Telemann: Concertos. Performer: Joseph Crouch. Orchestra: The English Concert. Director: Harry Bicket. Orchestra: BBC Symphony Orchestra. Choir: BBC Symphony Chorus. Conductor: Martyn Brabbins. Ensemble: Ensemble Maysyas. Conductor: Peter Whelan. Singer: Montserrat Caballé. Orchestra: Philharmonia Orchestra. Director: José Collado. Performer: Nicholas Angelich. Orchestra: Insula Orchestra. Conductor: Laurence Equilbey. Ensemble: Chanticleer. Director: William Fred Scott. Performer: Georgia Mancio. Performer: Alina Bzhezhinska. Performer: Georgia Mancio. Performer: Luiz Morais. Performer: Georgia Mancio. Performer: Kate Williams.